Chicago architects George and Arthur Dean — or at least their firm — designed many of the buildings in Morgan Park. Dean & Dean played an active role in shaping the nation’s Prairie School architectural theory and national movement led by well-known architects Frank Lloyd Wright and Louis Sullivan. In 1916 Larry Franklin Robinson left Wright’s offices and went to work for Dean & Dean, where he was put in charge of two U.S. Steel projects, including Morgan Park. So Robinson, not one of the Dean brothers, likely drew the actual plans for the Hospital and the Good Fellowship Club. U.S. Steel built the Good Fellowship Club for Morgan Park residents, all of whom worked for U.S. Steel when the community was first built. The cost was $153,000. Constructed of concrete like most other Morgan Park buildings, the Club was faced in stucco and measured 158 by 258 feet with four wings grouped around a central core. The building featured an auditorium with seating for 480 people, a gymnasium, a running track, a cafeteria, bowling lanes, shower facilities, a youth section, and a swimming pool. There were outdoor courts for volleyball, basketball, tennis, lawn bowling, and croquet. It was the center of social life in Morgan Park, and members paid $1.50 per month in dues. By 1968 membership had declined, perhaps because in the 1940s Morgan Park was opened to all Duluth citizens and the city took control of the club. The building closed in 1980. When the city decided to demolish the club, the Minnesota Historical Society resisted: the building was considered part of a historic district. 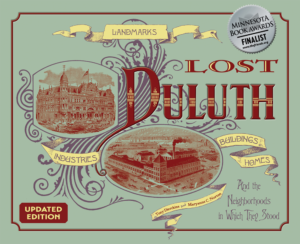 The Duluth News-Tribune called it “an albatross.” In October 1981 the Minnesota Historical Society relented and the building was demolished; later many residents of Morgan Park regretted the loss. A smaller clubhouse was built on the same location.